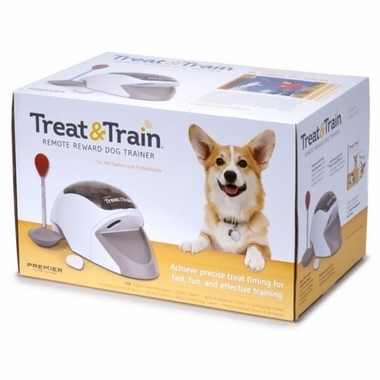 Premier Treat & Train Remote Reward Dog Training System is an incredibly useful dog training aid for all dog owners with innovative and unique design. This new remote dog training aid lets you control your pet's behavior using obedience commands issued by a hand-held remote. 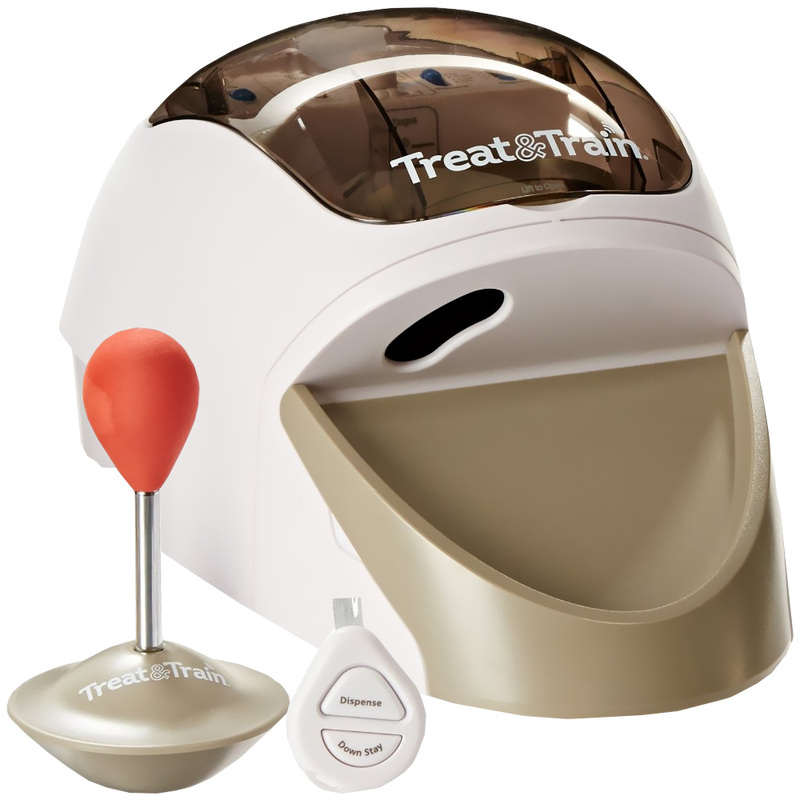 Treat & Train Remote Reward Dog Training System reward your dog's good behavior instantly by remote control, and it automatically feeds a treat every few minutes while you are gone. You can always combine your dog's favorite treats with this remote reward training system. Hand-held remote that can operate on 4 separate channels, and which allows you to work from a distance of up to 100 ft and even through walls. Target training wand with detachable base to teach tricks, heeling, and jumping. Two treat dispenser disks for different sized kibble or treats of uniform small sizes. Dr. Yin's illustrated training manual and DVD. Rugged, dog-proof housing measures 16 x 7 x 8 inches; it weighs 3.5 lbs. and is remarkably stable. It will run for about four months on 4 D batteries. The remote control runs on an included 23A-12V battery. 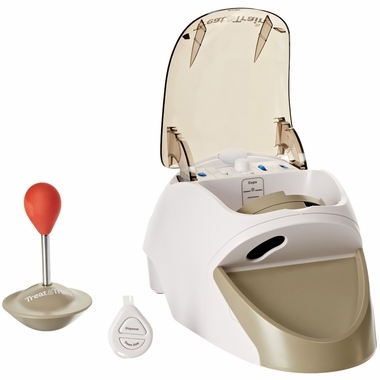 Manners Minder replaces the pet's old bowl, holding and dispensing your dog's kibble. Food can be dispensed by remote control (which sounds an audible tone) or automatically in programmed intervals (e.g., later in the program when your dog's desired behavior is to stay quietly in one place). You'll learn to use Manners Minder's "tone and treat" techniques along with visual cues and verbal cues so your dog will clearly understand the good behavior you want. Train obedience commands such as "stay", "sit", "down", and "come here"
Crate train or teach your dog to be calm when alone. 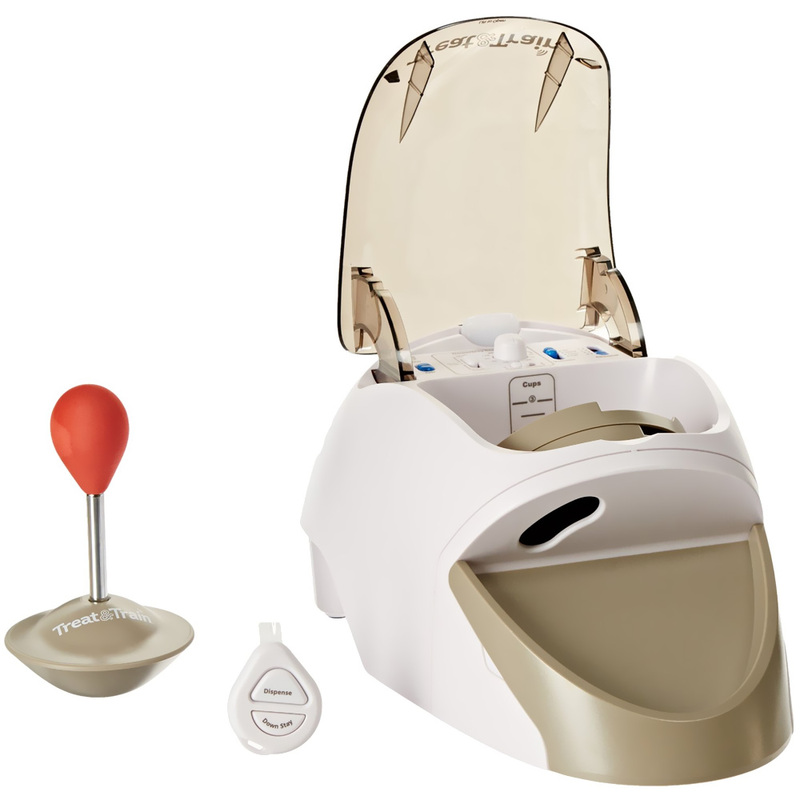 The Manners Minder is ideal for preventing and working with mild separation anxiety. Train your dog to sit still while you groom them. Train the pet to do tricks. The dog bowl can fit different sizes of dog treats.